These cyclists in the Tour de France appear superhuman as they spin those pedals and hurtle along at the speed of a car for hundreds of miles every day and then cycle up mountains I’d prefer to snowboard down. But the laws of physics still affect them. So when pedestrians crowded the streets causing a motorbike to brake suddenly, the three leading cyclists crashed straight into the motorbike and ended up on the road. 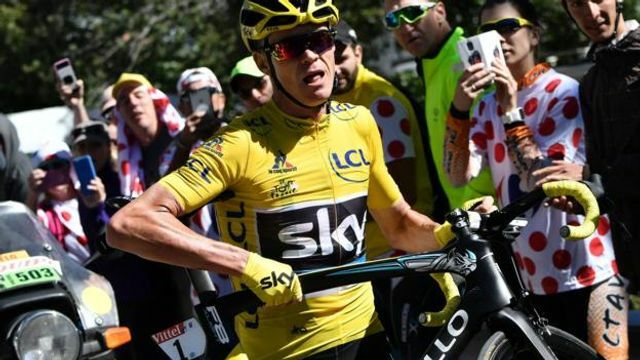 To make matters worse, another motorbike immediately behind crashed into the back of one of the trio – Froome, the British defending champion and current overall leader. Were it not so serious, pictures of Froome running up the mountain in his cycling gear but no bike may have been farcical. So were the race’s organisers reckless by allowing this to happen? What can we learn from a health and safety perspective? In this country, the Health and Safety Executive consistently stresses a common sense approach to health and safety. Now professional road cycling will always have dangers – Froome reached 90 km/hr racing downhill as he sped away from his competitors for a win last Saturday. In that precarious aerodynamic position, had he made an error it probably would have hurt. The organisers cannot eradicate all dangers. On the other hand, organisers occasionally change the route because of exceptional circumstances. For example, yesterday,at the intended finish line atop Mont Ventoux, the wind exceeded 100 km/hr, so the organisers moved the goalposts down the hill to a safer spot for the riders. To return to yesterday’s crash: could the riders have reduced the risk without undue cost and without eliminating all spectacle? Well as Fabian Cancellara said, a few more barriers to keep spectators away from the riders would have helped. But to what end? Should they have had lined the entire 184 km route? Chris Boardman, commenting on ITV, pointed out that everyone knows where the spectators congregate; it's within the last few kilometers, especially on mountain stages. Lining the last five kilometers would probably have been a proportionate and effective measure. In your business, the same principles apply. Health and safety has to be paramount. Cutting corners may give you a lead on your competitors, but in the long run it will not be good for the industry or for your business. Regulations have been devised to assist in our approach to common problems, and to ensure a level playing field. Beyond that, common sense is needed so as to apply health and safety in a proportionate manner. elXtr has numerous useful tools, guides and policies to assist you on this journey. If you’re not already a member of elXtr but you’re interested in joining our community, give us a call on 0345 351 0025 and we can talk you through your options. Veteran rider Fabian Cancellara tweeted: "What a scandal today for Le Tour, No safety and too much chaos on Mont Ventoux. "This is definitely not what cycling needs. Not enough barriers for safety."